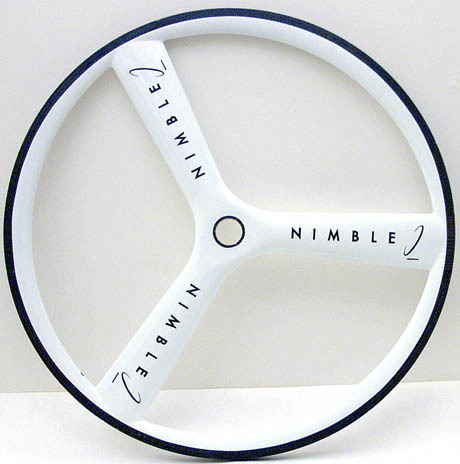 The Nimble CROSSWIND is available in specialty paint colors. Pictured above are solid colors red and periwinkle along with natural carbon. Available standard solid colors are: Red, Periwinkle, Mango and White for $220/set upgrade. Custom solid colors to match anything are available by quote and are typically $35 to $50 extra and require access to either the manufacturer color code or a color sample. Custom design work is also available by quote (check out the examples below). USA colors are $520/set. Availability ranges from immediate to 5 weeks. 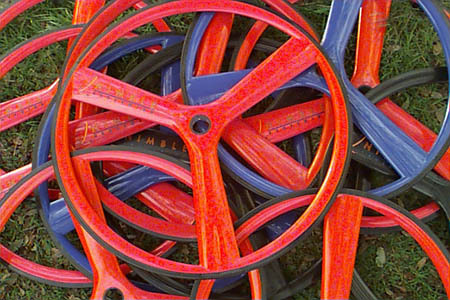 Paint adds approximately 30 grams per wheel. Also see FLY color upgrades. 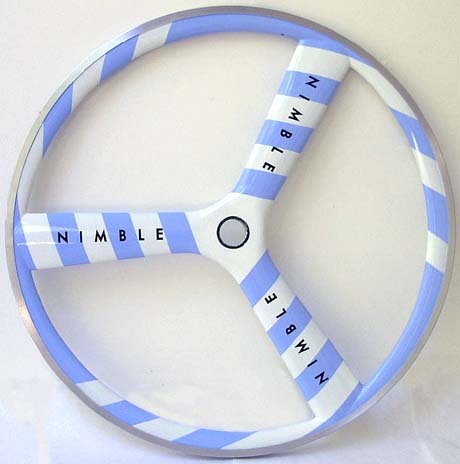 The sky blue and white stripe was done for front and rear clincher 700C pair. 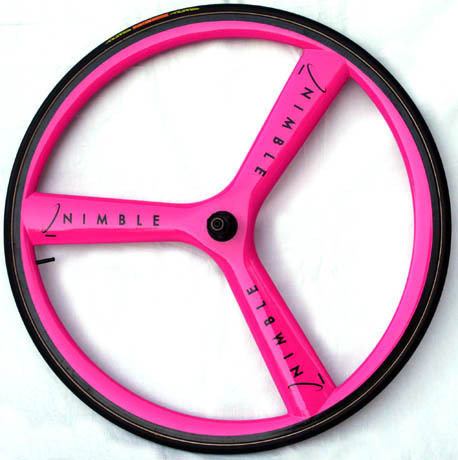 Pro racer Bella Comerford, known for her fondness for pink, sent a piece of her frame to custom match color to her bike frame. Her front is the Fly below. 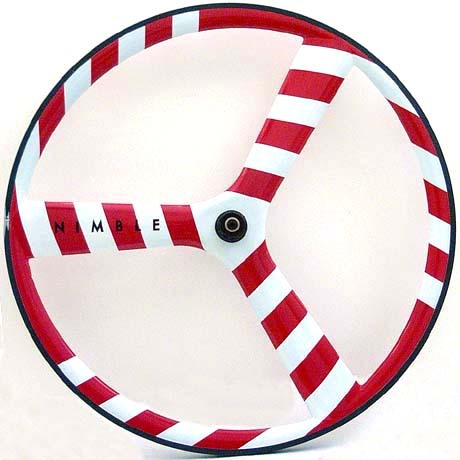 This tubular 700C CROSSWIND blue with white star wheel is a front paired striped red and white rear below displayed below it. 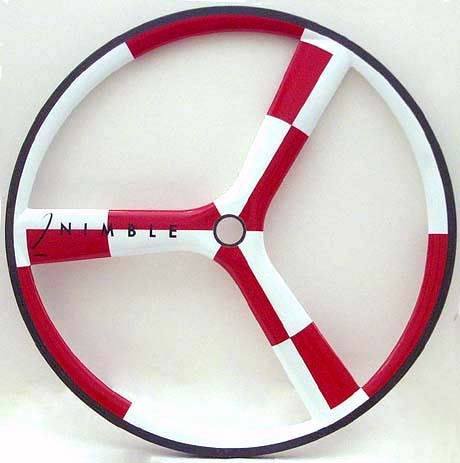 This red and white Mondrian style block pattern below, matched a Cervelo painted with a matching color block arrangement. 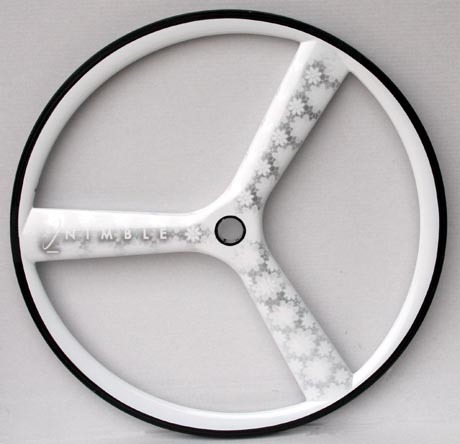 This solid white 700C front tubular was painted for world champion pro Peter Reid to match his Hawaii IM ride. 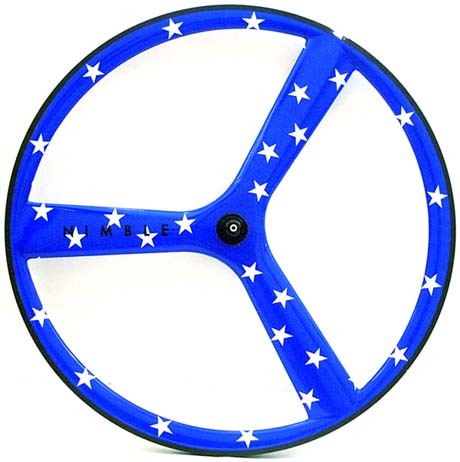 Our customer custom matched his blue and white bike frame colors with this blue and white pattern simplification of the USA 3 prong star design. The image captured above does not do justice to the decoration. 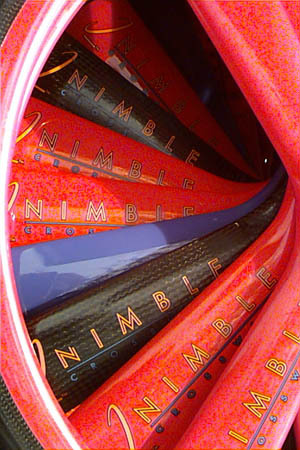 Nimble customer Michael Tsagalakis, wanted this lace pattern to match his two tone bike frame design. 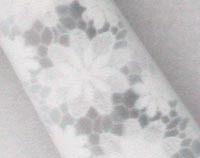 The stencil was literally a piece of antique lace. 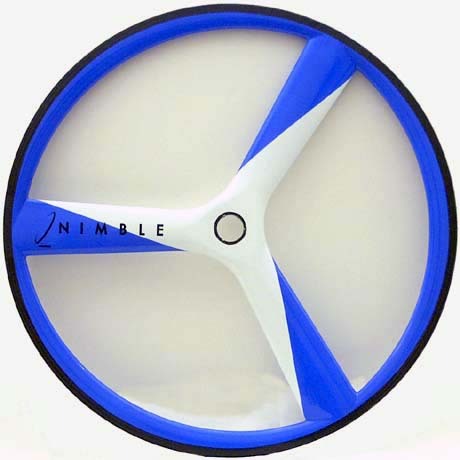 We also offer custom Nimble logo color options done as hand stenciled knockouts in any color placed into the foreground color (to replace the standard Nimble decals). This option is labor intensive and separately priced. This is available for both the CROSSWIND and FLY. Please note that the FLY rim has a very low radial profile below the braking surface that limits logo size and visibility. 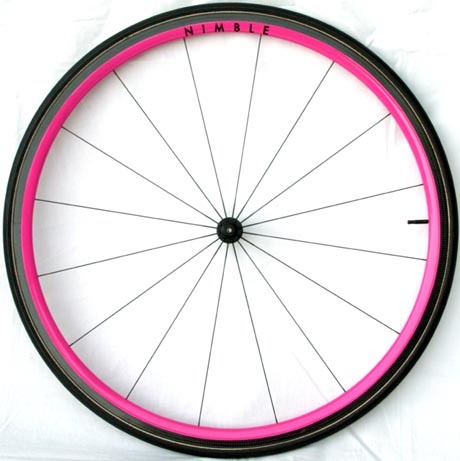 See the full side image above of Bella's pink 700C 16 spoke FLY. Knockout lettering can also be left as the natural background carbon weave revealed from beneath. This is a subtle and beautiful carbon highlight. 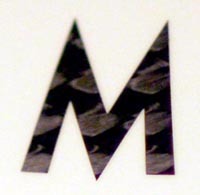 The magnified M at the left is from the center of a "Nimble" written on a white wheel with a clear knockout. This option is recommended for lighter paint shades.